Part 1 will cover the “what” and “why” and an overview of the “how”, with examples of all the pieces that might make up a digital portfolio. Then in part 2, we’ll get stuck into the MANY options for creating digital portfolios using software, tools and other resources you probably have access to already. Lastly, part 3 will show you step-by-step how to put together a digital portfolio, using a specific music project example: All About The Drum Kit. What is a digital portfolio? A collection of student work in a digital format – digital artefacts – which demonstrate evidence of learning. Digital portfolios are usually curated by the student themselves and include work in multiple formats including text, hyperlinks, video, images and audio files. Digital portfolios are ideal for music. One of the best things about presenting work in a digital format is the opportunity to include rich forms of media, such as video and audio files which make a lot of sense for music students. Digital portfolios are more readily accessible to a wider audience (such as teachers throughout the school, parents and other students), especially if they are available online. It’s also possible to duplicate the work and present it in more than one way, for different purposes, or for multiple types of portfolios. 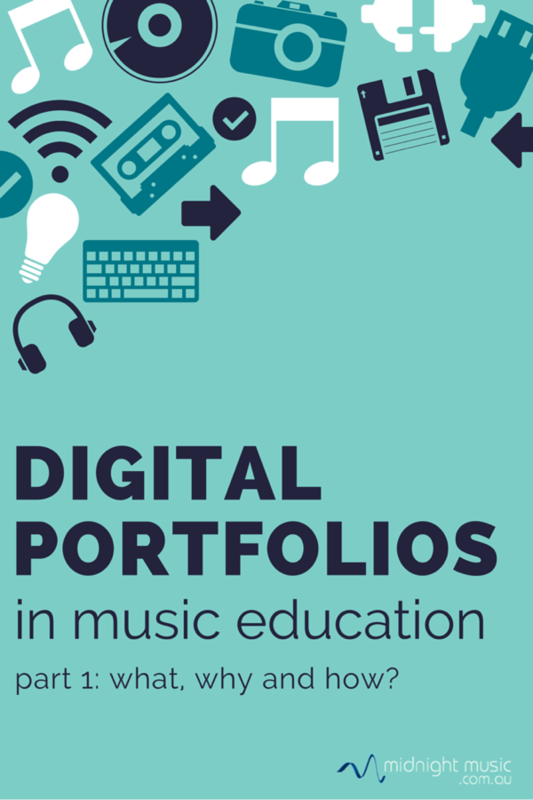 How can my students create digital portfolios in music class? Audio recordings (mp3 file or WAV file) may include recordings of a performance, a composition, analysis of a musical work, or a description of a process. It’s similar to the video option, but just without the visuals! Text-based artefacts can include essays, written responses, definitions, song lyrics, and may also include hyperlinks to further reading or other support material. Images go beyond simple photographs. Photos of students “in action” are a useful part of a digital portfolio, but there are many other image types, including screencaptures (screenshots), labelled diagrams, mind maps, flow charts, digital drawings and many more. Once your students have gathered all the artefacts that demonstrate their learning, they’ll need to present them in a single location, in a coherent way. Once again there are a number of tool options here, but it needs to be something that can handle all (or most) of the digital mediums discussed above: video, audio, text and images. In part 2, of Digital Portfolios in Music Education I’ll be discussing specific software and tools for each of the above digital artefacts types – video, audio, images and text. There will be suitable options for all devices and operating systems, whether Mac, Windows, Chromebooks, iPads or Android devices. Following on in Part 3, I’ll take a music education project example and show you step-by-step how to capture different types of digital artefacts and how to put them together in a portfolio. Another great article Katie, I look forward to reading your ideas in the upcoming additions to this one!